The High Altar, Eve of the Presentation, Friday, February 1, 2019, Blessing of Candles, Procession & Solemn Mass. The celebrant, in this case Father Jay Smith, is the last of the clergy to reverence the altar at the beginning of the Solemn Mass. Photo from Sunday, February 3, 2019. The laying-on of hands is another New Testament gesture. It is associated with the presence of the Holy Spirit for healing, blessing, and setting apart ministers. Another is the washing of feet, mentioned not only in John’s gospel (13:1–17), but also in the First Letter of Paul to Timothy (5:9–10). The Prayer Book requires that I touch or hold the bread and the wine during what we call the words of institution, and I have always done so. Always. But I have come to think that behind these gestures lies an ill-considered and unbiblical clericalism that lives on among all of us. I wish we Episcopalians had the rubric that the Church of England’s Common Worship (2000) has. It’s this: “In Holy Communion the Church, following the example of the Lord, takes, gives thanks, breaks and gives. The bread and wine must be taken into the president’s hands and replaced upon the table either after the table has been prepared or during the Eucharistic Prayer” (page 333). That’s a change to the Prayer Book I could welcome. Even when a deacon assists at Saint Mary’s, it is the celebrant who places the bread and the wine on the corporal, a gesture designating over what we, the congregation, are giving thanks. If we had this permission, I would not touch the bread and wine during what we call the words of institution. YOUR PRAYERS ARE ASKED FOR Ethelyn, Flor, Al, Lars, Linda, Henry, Dorothy, Dennis, Paula, John, Alexandra, Kyle, Carolyn, Ivy, Jondan, Eloise, Michael, Karen, Susan, Marilouise, Robert, May, Takeem, David, Sandy; Aidan, religious; Horace, Daniel, Gaylord, Louis, and Edgar, priests; and all the benefactors and friends of this parish. After the opening acclamation, the opening song of praise, always Gloria in excelsis except in Advent and Lent, is sung. Incense is prepared and the altar is censed. GRANT THEM PEACE . . . February 10: 1895 Francis Jacob Dominick, Margaret Jane Cochrane; 1896 Elizabeth Lander; 1918 Clara Howard Robinson; 1934 Richard Ellis Jones; 1956 James Harvey Carll, Jr.; 1968 John E. Mery Lees; 1983 Constance R. Earle. WE LOOK FORWARD TO RECEIVING YOUR PLEDGE CARD! . . . If you have not yet completed a pledge card for 2019, we encourage you to do so as soon as possible. Our needs are urgent. Our mission is clear. We welcome your support, and we are grateful to all those have supported Saint Mary’s so generously in the past. THIS WEEK AT SAINT MARY’S . . . Sunday, February 10, The Fifth Sunday after the Epiphany, Sung Matins 8:30 AM, Mass 9:00 & 10:00 AM, Adult Education 10:00 AM, Solemn Mass 11:00 AM, Solemn Evensong and Benediction 5:00 PM . . . Wednesday, February 13, Sung Mass 12:10 PM; Wednesday Night Bible Study Class 6:30 PM in Saint Benedict’s Study. . . Thursday, February 14, Mass with Healing Service 12:10 PM . . . Friday, February 15, Centering Prayer 6:30–8:00 PM, Atrium, Parish House, 145 West 46th Street. As Father Smith sings the Collect of the Day: Marie Postlewate (L), Father Jim Pace, Julie Gillis, and Marie Rosseels. AROUND THE PARISH . . . Parishioner Ethelyn Bader is receiving treatment at home while preparing for a surgical procedure in about a month’s time. Please keep her in your prayers . . . We are happy to report that parishioner Gladys Ramos-Reyes recently completed her undergraduate degree at the Silberman School of Social Work at Hunter College. She is now applying to master’s programs in social work here in the city. Gladys managed to complete her degree while working full-time. Her hard work, discipline, and commitment are inspiring. Please keep Gladys, and her equally hard-working and supportive husband, Luis Reyes, in your prayers . . . We are also happy to report that longtime parishioner and incense maker, Kenny Isler, has returned to the metropolitan area. Kenny recently sold his home in Arizona and took some time to visit the southwestern and southeastern United States. He has finally decided to settle down in the historic Hudson Valley town of Cold Spring, about an hour and a half north of the city. 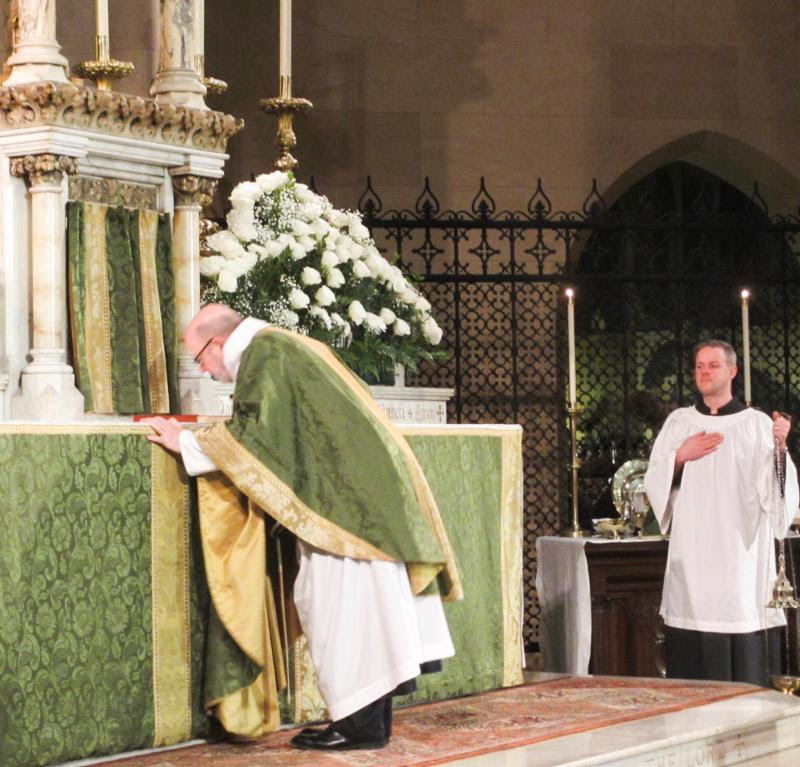 He has been back to Saint Mary’s to refresh his recent batch of incense, and he served at the altar on Sunday. We hope to see him often here at the parish. He looks forward to meeting those who have come to Saint Mary’s while he has been living in Arizona . . . It is always nice to be able to welcome good friends who live out of town back to Saint Mary’s. Last Sunday, several members of the Brotherhood of Saint Gregory were with us for the Solemn Mass and for Coffee Hour. 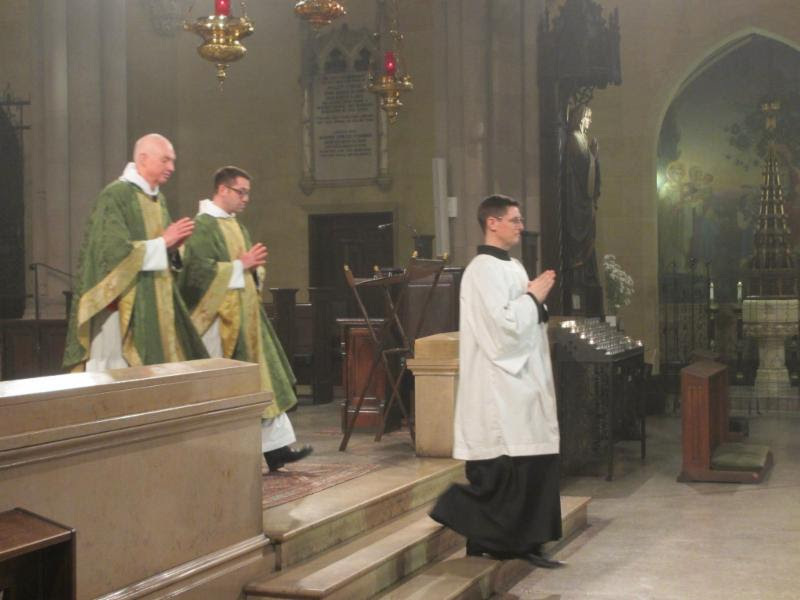 Others joined us for the Vigil Mass on Saturday evening and for Evensong on Sunday. The brothers are all kind, friendly, and willing to share good stories about their lives and ministries. Those ministries are many and varied. For more information about the Brotherhood and the work of the brothers, visit their website . . . Attendance: Last Sunday 155. Leroy Sharer was reader on Sunday. 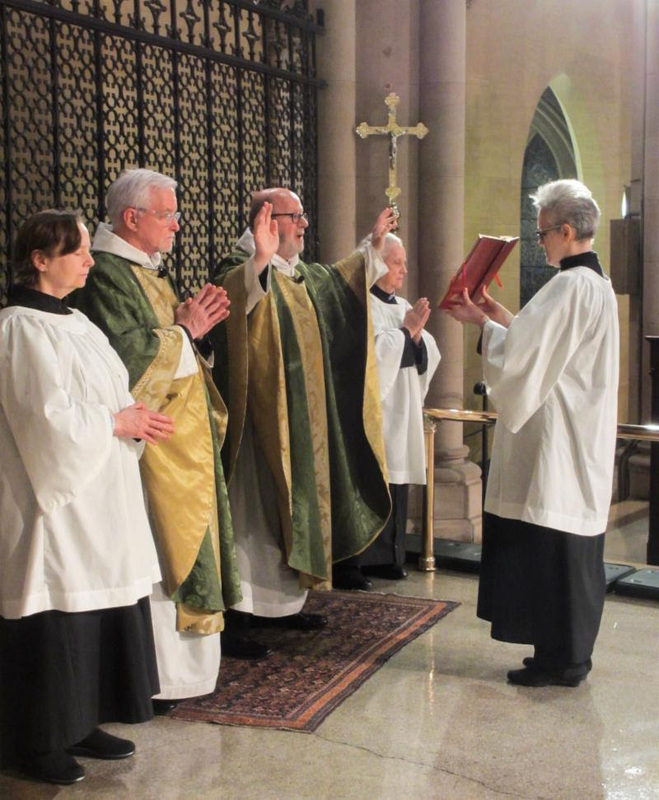 Members of the congregation and vested servers share in the ministry of reading at Mass. FROM THE MUSIC DIRECTOR . . . The setting of the Mass on Sunday morning is the four-voice Missa octo vocum of Hans Leo Hassler (1564–1612). Born in Nuremberg and baptized on October 26, 1564, Hassler’s musical career bridged the late Renaissance and early Baroque periods. His initial musical instruction was from his father, Isaak Hassler (c. 1530–1591). Hans Leo left home in 1584 to study in Venice with Andrea Gabrieli (c. 1532–1585) and become a friend of, and fellow pupil with, Gabrieli’s nephew Giovanni (c. 1554–1612). Thus, Hassler was one of the first of a succession of German composers to experience in Italy the musical innovations that were shaping what would later be identified as baroque style. Hassler was recognized in his day not only as a composer, but also as an organist and a consultant on organ design. Although he was a Protestant, Hassler’s early compositions were for the Roman church. His Missa octo vocum, Mass for eight voices, was first published in Nuremberg in 1599. It is organized largely as a dialogue between two four-voice choirs which sing in antiphonal alternation, but then come together strategically in the splendid richness of eight parts. The established Venetian polychoral style is evident in this Mass setting, along with the harmonic clarity characteristic of the emerging baroque style in Hassler’s time. The Motet sung during the Communion on Sunday is a setting of Psalm 133 for five voices (SATTB), also by Hans Leo Hassler. The style of the music is more chordal than polyphonic, with voices often singing text in rhythmic unison. Imitative passages along the way suggest the Venetian polychoral style for which Hassler was also known. CHRISTIAN EDUCATION . . . On Sunday, February 10, parishioner Mary Robison will make a presentation to the class on an important archival project here at the parish. Mary writes, “On February 10, we’ll look at Saint Mary’s history through its publications, The Arrow (1891–1899) and Ave (1932–2004), now digitized and available for research. What can these documents tell us about our parish and its rectors, from the Gilded Age through World War II? I’ll talk about why these publications existed, and discuss how they’re useful for research. I’ll also mention some of the interesting things I found—the more things change, the more they stay the same! . . . Coming Up, Save the Dates: On Sunday, February 17 and 24, Father Borja Vilallonga will lead the class in a discussion of his doctoral research done at the Sorbonne. Father Vilallonga was ordained in the Roman Catholic Church and is now a priest in the Old Catholic Church, which is in full communion with the Episcopal Church. He is currently a postdoctoral fellow at Columbia University, working with Prof. Carmela Vircillo, a great friend of Saint Mary’s, who recommended us to Father Vilallonga. His research is centered on nineteenth- and early-twentieth-century European Christianity—the Oxford Movement, Gallicanism, early liturgical reform, Pius IX, the First Vatican Council, and the transformation of Roman Catholicism between Vatican I and Vatican II . 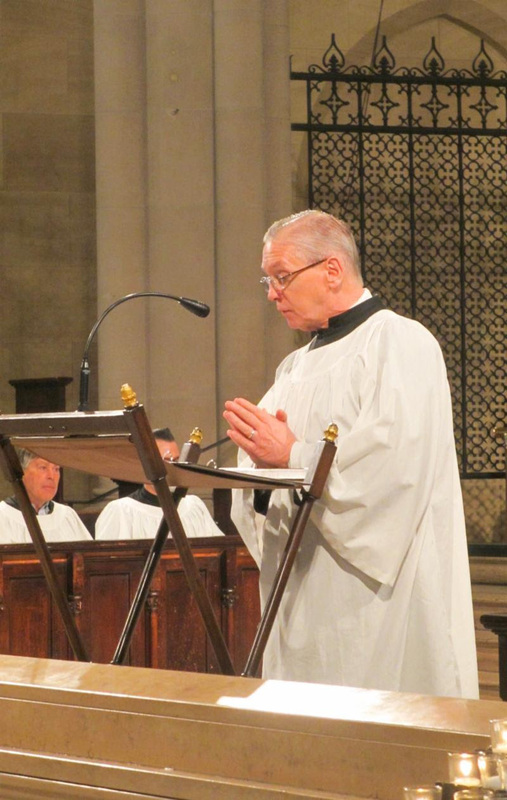 . . On the six Sundays of Lent—March 10–April 14— Father Peter Powell will resume his series on the Elijah/Elisha cycle in 1 Kings 16:23–2 Kings 13:25 . . . The Wednesday Night Bible Study Class, led by Father Jay Smith, will meet on February 13 at 6:30 PM in Saint Benedict’s Study. The class will begin its reading of the Letter of Jude. The Retiring Procession: The Rector and Father Matt Jacobson were concelebrants. HOSPITALITY MINISTRY AT SAINT MARY’S . . . We hope to receive donations to help pay for the holy-day receptions on March 25 (Annunciation), April 20 (Easter Eve), and Thursday, May 30 (Ascension Day). If you would like to make a donation, please contact the parish office. The total cost of each reception is around $500.00. We appreciate all donations in support of this important ministry. Any and all donations are always used to make up the deficit each year we normally experience in the hospitality budget. When making a donation, please make a note that it is for the Hospitality Ministry, and we thank you. There were many smiles at the end of the liturgy on the Eve of the Presentation.